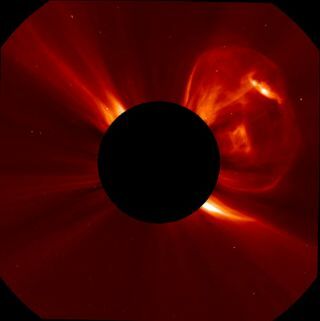 A coronal mass ejection (CME) bursting off the left side of the sun. This image was captured by the SOlar and Heliospheric Observatory (SOHO) at 6:05 PM ET on September 21, 2011. SAN FRANCISCO — Following an extended quiet period, the sun is ramping up for an era of intense activity, and researchers are prepping to prevent solar storms from disrupting life here on Earth. For the first time, scientists say, it's possible to predict how solar storms will hit our planet, much like meteorologists predict how hurricanes will hit a coastline. This early warning allows power grids to adjust for electrical fluctuations, and airlines to switch to alternative communication systems that won't be affected by the vagaries of space weather. Yet this forecasting ability is in its nascent stage, experts say, and still leaves a lot of gaps to fill when it comes to space weather. This transformation comes at a good time. The sun varies from phases of relative peace to eras rocked by magnetic solar storms over a cycle of roughly 11 years. Lately, the sun has been at its quietest in two centuries, said Daniel Baker, the director of the University of Colorado, Boulder's Atmospheric and Space Physics Lab. "The most recent minimum was broader, deeper and was very much comparable to a very low period called the Dalton minimum back in the 1800s," Baker said. Now, however, the sun is shaking off its slumber. Sunspots, dark patches caused by strong magnetic activity, are back up, Baker said, and the sun is entering another period of solar maximum, set to peak in 2013. Researchers expect this period of storminess to be no more intense than in previous high years in the cycle, but even a moderate solar maximum can spur impressive storms. "Some of the largest solar storms on record actually occurred during modest sun spot peak periods," Baker said. The sun's activity matters on Earth because when the sun spews huge sheets of solar wind — called coronal mass ejections — the particles from these ejections can disrupt the magnetic field surrounding our planet. On the plus side, these disturbances create beautiful auroras in the sky near the North and South Poles. However, they can also cause electrical fluctuations in power grids and disrupt satellite communications. Given that satellites affect everything from global-positioning systems to airline communications, disturbances can be costly and dangerous. So much of our modern technology is at risk from space weather, including satellites, communications and power grids. Airline passengers flying over the poles and astronauts can also be adversely effected. Studying the causes and effects of space weather can help us to better predict these events and to take precautions to minimize their impacts. With enough warning, there are ways for industries to protect themselves from these solar eruptions. Power-grid operators might adjust voltages to make sure energy fluctuations don't max out the grid, said Rodney Viereck of the National Oceanic and Atmospheric Association's (NOAA) Space Weather Prediction Center. Companies that rely on precise GPS measurements, such as deep-sea drilling projects, may delay operations until the storm passes. Airlines may switch communications systems or even re-route flights to ensure that airplanes don't go silent. To make these adjustments, industries need to know when and where a solar storm might hit, and how strong it will be. NASA, NOAA (the National Oceanic and Atmospheric Administration) and the Department of Defense (DOD) are working to improve forecasting of space weather. Currently, these groups can often give one-to-three-days' warning before a storm. The need is becoming more urgent as more and more technology comes online that can be disturbed by solar storms, Viereck said. At the last solar maximum, almost no farmers used GPS, he said. Today, on the other hand, farmers use GPS to lay out fields, map yields, and guide farm equipment. Those new electronics users will need to learn on the job how to adjust when solar storms hit. Currently, real-time warnings of solar storms come from a suite of NASA spacecraft, including its SOHO (Solar and Heliospheric Observatory) and SDO (Solar Dynamics Observatory) satellites, as well as a solar-wind monitoring craft called the Advanced Composition Explorer (ACE). The latter satellite has already functioned for 10 years longer than it was designed to work, Viereck said, but NASA, NOAA and the DOD plan to launch a replacement, called DISCOVR, in January 2014. Not all solar disruptions can be predicted, however. In 2006, a solar radio burst knocked out GPS across the United States for 10 minutes, said Louis Lanzerotti of the New Jersey Institute of Technology. Because solar radio travels about as fast as sunlight, there was no warning. That's why continued scrutiny of solar activity is so important, he said. "We do not understand any of the physics behind the solar flare event, how many electrons were produced. There was no prediction and no warning," Lanzerotti said. "There is some of the fundamental physics that we don't understand." You can follow LiveScience senior writer Stephanie Pappas on Twitter @sipappas. Follow SPACE.com for the latest in space science and exploration news on Twitter @Spacedotcom and on Facebook.